WhatsApp new beta update for its Android app brings a new feature called the Consecutive Voice Messages. The Android beta app has been updated to version 2.19.86. 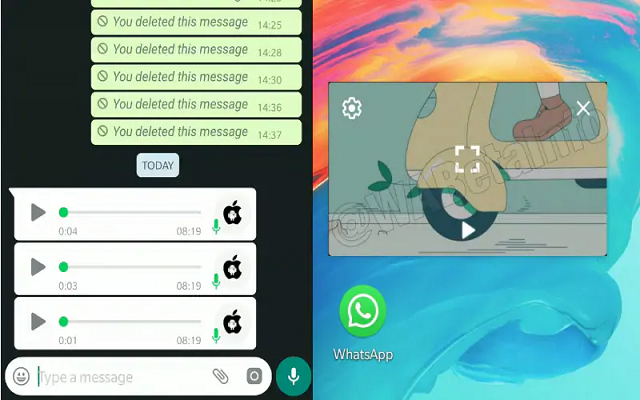 WhatsApp is also planning to improve the Picture-in-Picture (PiP) mode. Currently, the PiP improvements are disabled by default but will be enabled in the next updates after proper development. WhatsApp is also working on some other features as we informed you yesterday about the fingerprint authentication that will let users lock the app. The Consecutive Voice Messages feature will facilitate you in auto-playing of two or more voice messages sent one after the other. This feature is now available and functional. Last year in November, the company started the testing of this feature. In case you want to use this feature then you must have the updated version of the Android. If you want to check the feature then send the multiple voice messages to your friends. When they Play the first voice message then the second one will be played automatically after the first one ends. WABetaInfo was the first one that spotted this feature.